Contemporary and undeniably cool the vibrant coloured Moda firepit is the ideal way to add a burst of colour to your garden or patio and an effective way to heat your outdoor space. Create a log fire within the bowl, position the protective mesh cover and wait for the flames to dance! 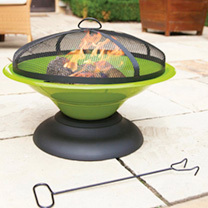 The large bowl of the firepit is made from durable steel, coated in a bright coloured enamel, which is easy to clean. Comes with a metal tool that allows the protective mesh cover to be easily removed and replaced when refuelling and when hot. Height 44cm, diameter 61cm. Colour available: Lime.